I guess you could say it’s in my bones. I vividly remember spending every free moment with my Dad in our home garage working on family or friends’ cars. He made me believe I could do anything if I just worked hard enough. Inspired by that confidence, I rebuilt my first engine in grade 7 — three years before automotive class was even available! Now with 18 years under my belt, I bring that same passion to work here at Company of Cars every day. Growing up, my father was a major influence on my decision to pursue the automotive trade. I vividly remember spending my free time working with him in our home garage on our family or friends’ cars. He made even the most minuscule detail interesting, and more importantly, made me feel that I could do anything if I just worked hard enough. Inspired by that confidence, I remember rebuilding the engine of my first car — in grade 7 metal work class. It was a beautiful 1969 VW Beetle. This was a particularly big deal, because automotive class wasn’t normally available to students until Grade 10 – and here I was, a young whippersnapper, doing it in Grade 7! Building on this natural passion for all things mechanical, Scott has now worked in the automotive trade for 18 years and held an Automotive Red Seal Certificate for the past 15 years. Working mainly in Automotive Retail Service centers, Scott has worked on just about every model and manufactured vehicle in existence. Additionally, Scott owned and operated a turbocharging performance shop, and for a substantial period, he was also employed with Midas — first as their head diagnostics technician and ultimately as an assistant manager. 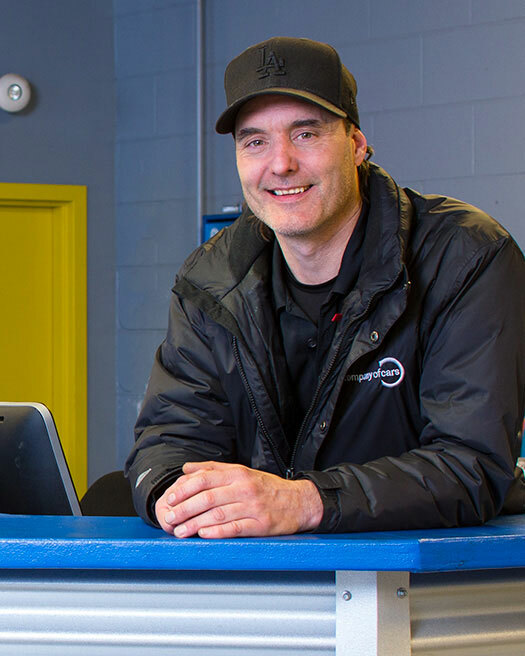 A man of many passions, Scotty’s newest passion is to build the Company of Cars service department to be second to none. When not working, Scott produces and organizes community events in the Vancouver core for local clubs, and hosts fundraisers giving back to local charities.